Regardless of whether your cabin is an ultra-luxurious waterfront home or a DIY shack in the woods, nothing says you’ve left the city quite as well as the outdoor shower. Some might cringe at the thought, imagining that this involves standing under a dribbling solar shower bag from Canadian Tire that’s been nailed to a tree, but there are some great off-the-shelf options out there that require little more than a garden hose to hook up. 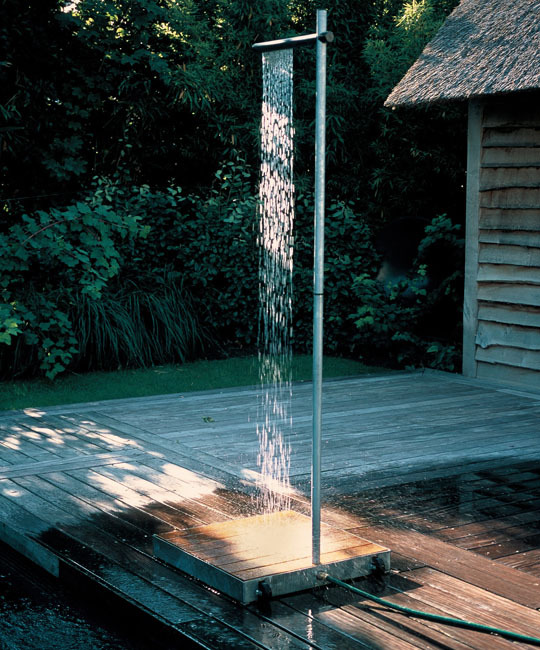 Design blog Apartment Therapy has an excellent round-up of gorgeous outdoor showers to fit any budget. Most of these can be set up in minutes and could easily be adapted to either run hot water from your indoor system or hook into an outdoor DIY solar heater and gravity feed system. If you’re feeling a bit more industrious, Cottage Life has a great plan for building an outdoor shower hut, complete with blueprints and instructional videos.